These pages offer highlights of the family tree research I have done. They are not complete, but I believe that as far as they go, they are correct. After a few tangential sidetracks early in my hobby days, I have tried to follow the maxim that incomplete information is better than incorrect information. My “shortest” line currently is researched back only six generations, and is ironically the line that gives me my name (the Hopkins line from County Galway, Ireland). 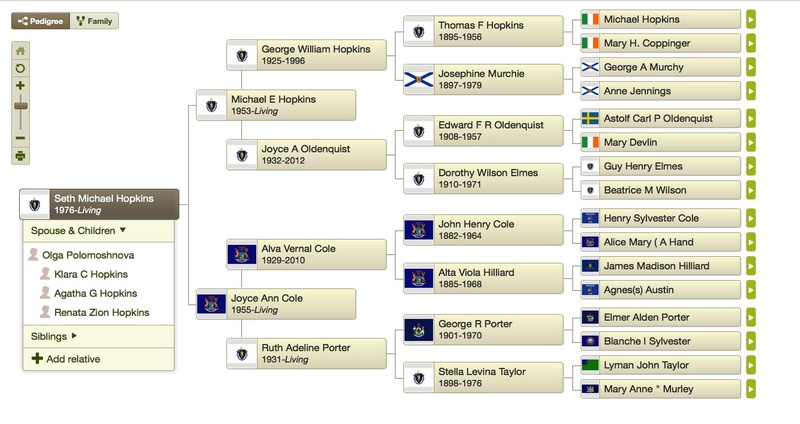 My “longest” line currently is researched back fifteen generations (the Mayflower line of the Mullins and Alden families). I have found among my ancestors more than one Pilgrim, more than one Revolutionary War soldier, and many more than one registered pauper. I have found a (pregnant) victim of the Spanish Influenza of 1918, a branch of a prominent Quaker family, and the surname “Cole” in the pedigree of all four of my grandparents. I have found hometowns in England, Ireland, Scotland, the Channel Islands, and Sweden. I have found that only my Grampy Cole’s line ever left New England once they got here, and that my Gramma Cole’s line has lived within 150 miles of Plymouth Rock since 1620. I have found that all four of my Grampa Hop’s grandparents were born outside the United States, and that Nana Hop had the most complex lineage, with non-English immigrant grandparents on her father’s side and a very old line of Yankees including a Revolutionary War solider on her mother’s side. In choosing to present the family tree in lines that reach back from my four grandparents, I must say what a blessing it has been to me that they all married young and that my parents married young, and that they kept their families intact. All four of my grandparents were part of my life through my childhood, adolescence, and into adulthood. Three of them saw me become a father. The love they gave me was profoundly important in forming the person that I am.